Wow, I have been absolutely RUBBISH at keeping this blog updated! So, what have I been up to of late? Quite a lot, as it seems! 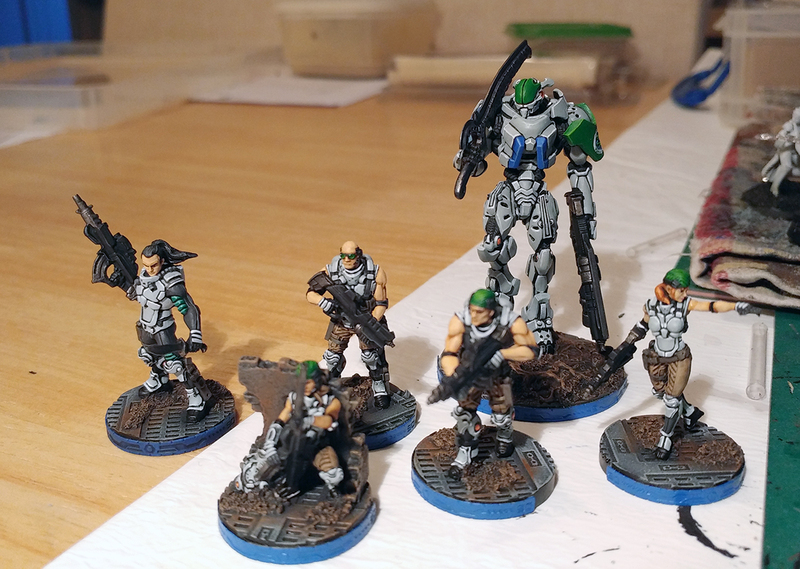 In addition to recording and editing several podcast episodes, I’ve also played quite a lot of games, and even done a fair bit of painting in the last couple of months! Strap yourselves in for a monster update with potato-quality pictures below! So, the podcast is going well – it’s still a bit of a passion-project, but we’re enjoying ourselves recording it, and we’ve gained a few international listeners too, which is encouraging! 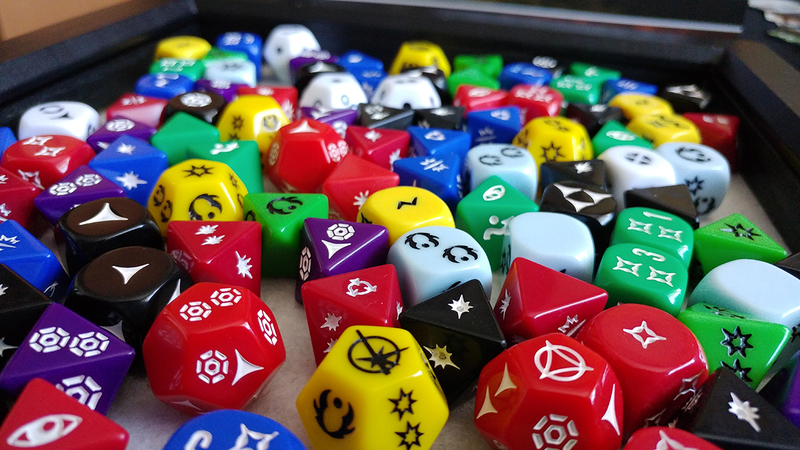 Our latest episode, plus the next one we do, are looking at how to get into games – a handy guide for anyone just starting out in the world of tabletop games, really. At the start of June, three of my friends and I went up to Birmingham to the UK Games Expo. We’d been up for a single day last year and had a great time, so this year we decided to do an overnight stay and do two days. Like the previous year, we had a fantastic time, and played many games. 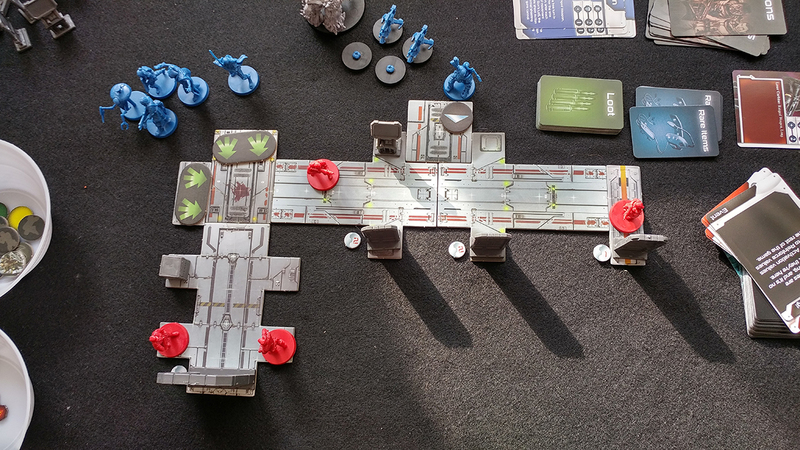 I picked up a couple of games myself – the excellent Adrenaline by Czech Games Edition, and Star Saga by Mantic Games. There’s a gallery of images on my Flickr page, here. Adrenaline is a deathmatch arena style game in the vain of Quake 3 Arena or Unreal Tournament, although it’s decidedly more ‘Euro’ in its approach to mechanics, with no dice-rolling of any sort involved. It’s got some really nicely detailed miniatures inside it, which you can guarantee I’ll be painting up sometime very soon, and we’ve had a lot of fun playing it. 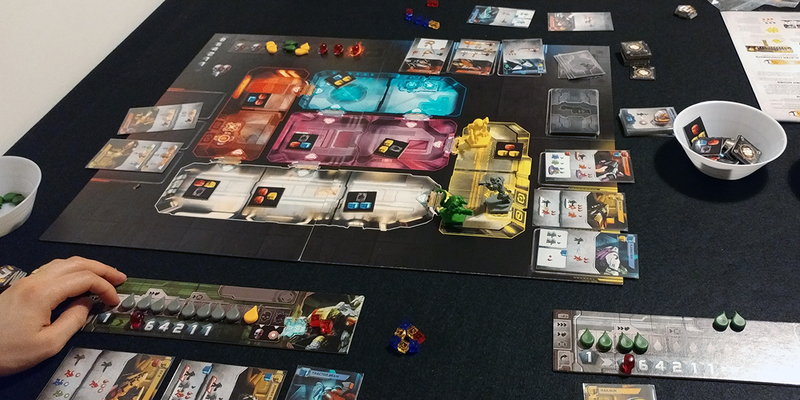 Star Saga is something I played earlier in the year when a friend of mine received his Kickstarter copy. I really enjoyed it, and was delighted to spy a copy at 50% off RRP at the show – an absolute bargain! 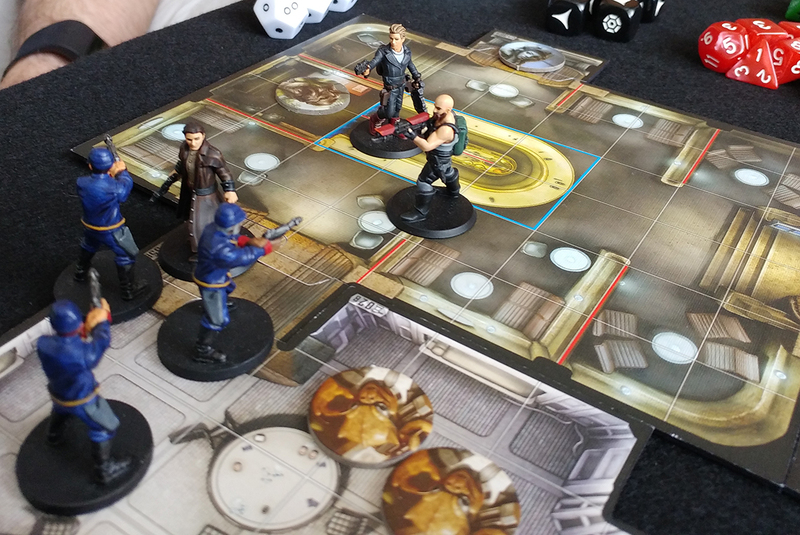 While it’s very similar to Imperial Assault in a lot of ways, it does a few things differently in terms of mechanics and offers an AI card deck to play the game co-operatively, which my friend and I have been doing. 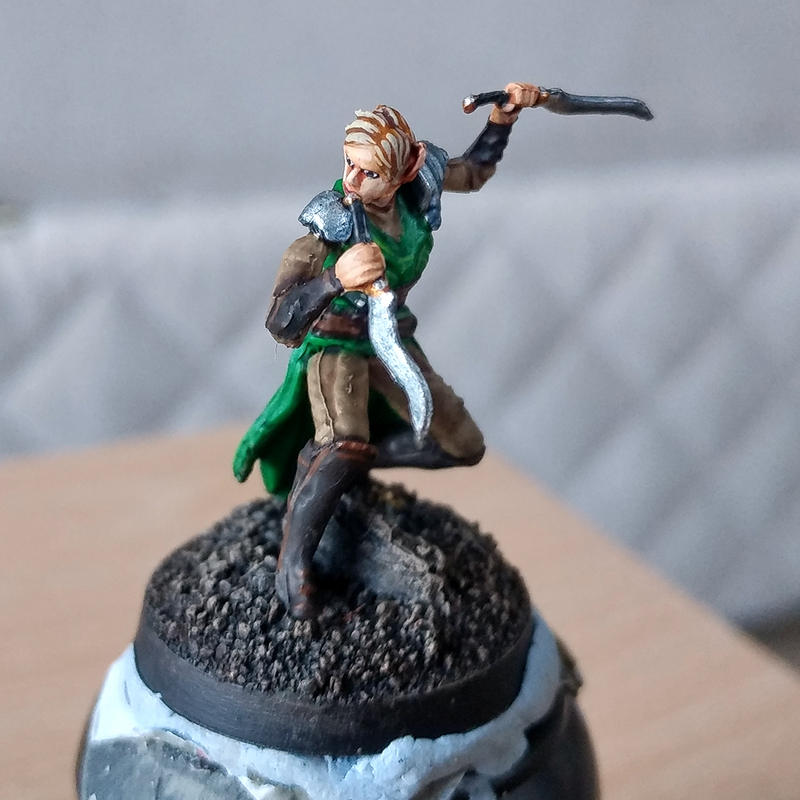 I’m looking forward to painting the box up as well, which I hope to do later this year! 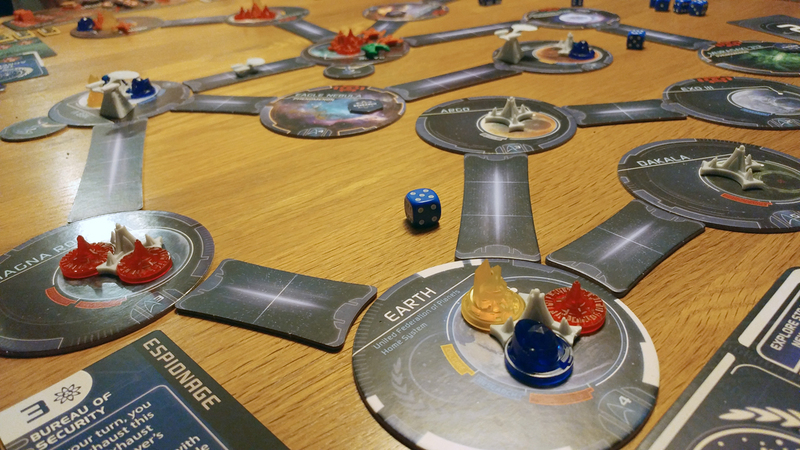 One of the friends I went to the expo with picked up Star Trek: Ascendancy, which I’d always looked at in passing, but not being the biggest Star Trek fan (I enjoy it, don’t get me wrong, by my geek-heart belongs to Star Wars), I hadn’t really entertained the idea of buying it. Thankfully, my friend was there to take the hit, and he’s picked up not only the base game but also all the expansions published to-date! I’ve played it once so far, but I’m looking forward to playing it again as it’s a lot of fun! Especially when I was able, as the federation, to sweep into the Kronos system and take control of the planet peacefully even after a gigantic Klingon armada had annihilated my fleet! 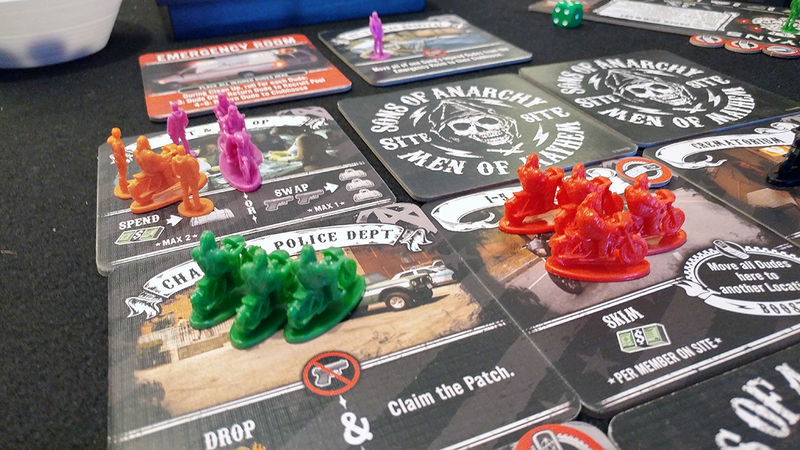 Most recently I played the Sons of Anarchy: Men of Mayhem board game, which I was pleasantly surprised by. I’ve never watched a single episode of the show, but the game (according to my friends) follows the background of the series really well, with each gang being represented very well by their rules. I’m looking forward to playing it again, as it was a nice and simple area control game that allowed for a lot of fun with the various hidden aspects of play, such as the Black Market phase, which sees players secretly trying to move contraband around. Try to move too much though, and you flood the market, meaning everybody gets less money! Because I’ve been buried deep in the Star Wars RPG of late, I’ve been picking up various bits and pieces to expand the experience. 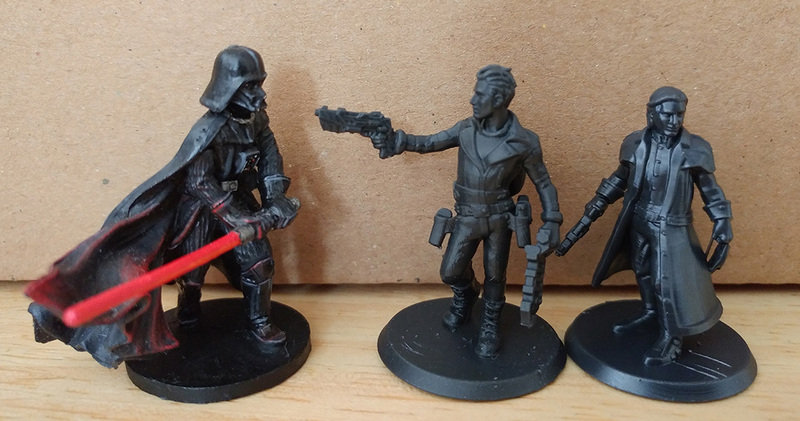 Star Saga was one of those, although probably the biggest purchases was the Star Wars Armada box and various expansions I got second-hand from a friend, plus the Heroforge custom models to represent all the player characters (and my own NPC who may show up from time to time). 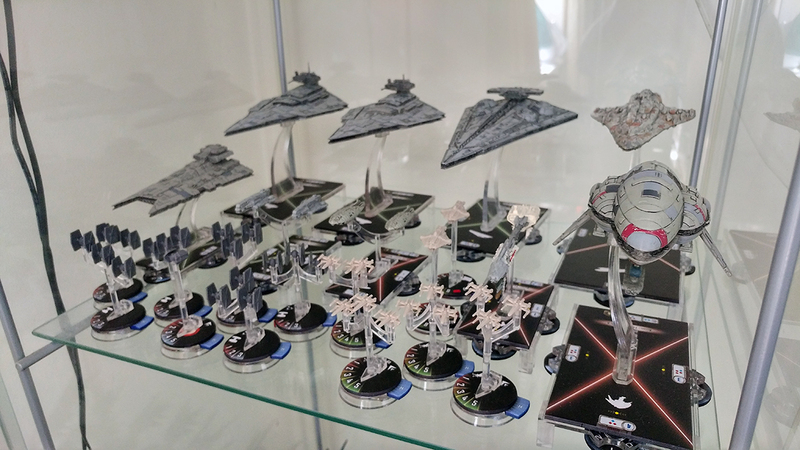 I’d had my eye on Star Wars: Armada for some time, but never really took the plunge, both because of the expense and because of other games demanding my time. 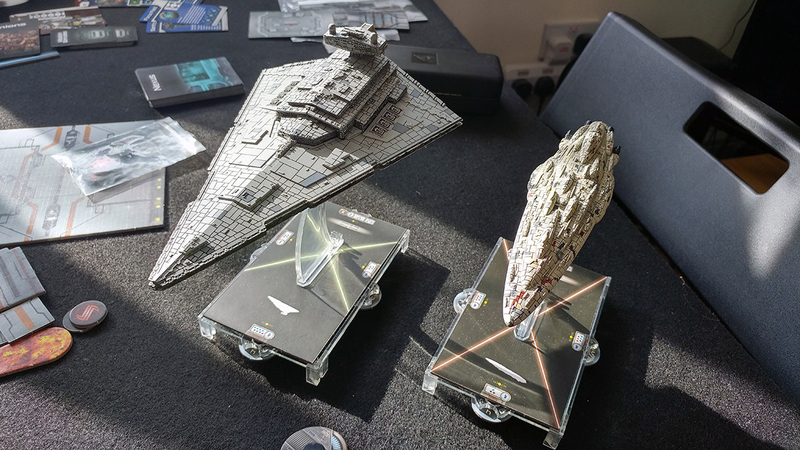 However, given that I envision my party of adventurers squaring off against capital ships at various points, I decided to make an offer to my friend for his Armada models, which he wasn’t using. 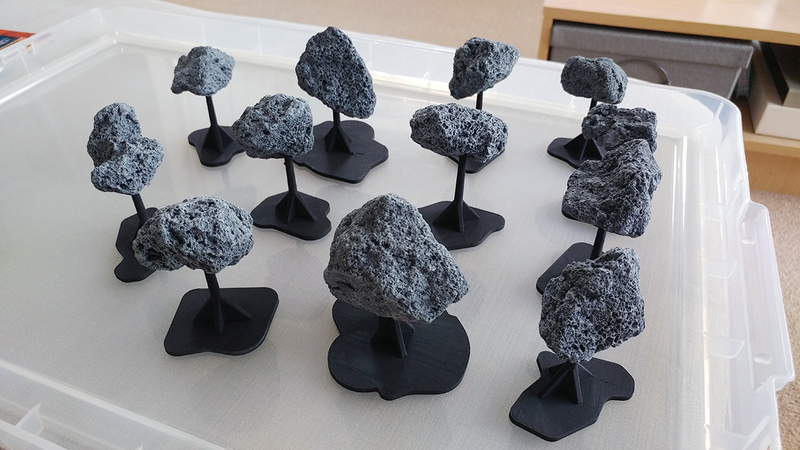 To go along with this space-related shenanigans, I found some 3D printer design files for some Asteroid stands for X-Wing – I got my friend with a 3D printer to run them off for me, and also pilfered a few lava rocks from him to use as Asteroids – I finished them off quite recently as well – they’ll work for both scales of space battle, hopefully! 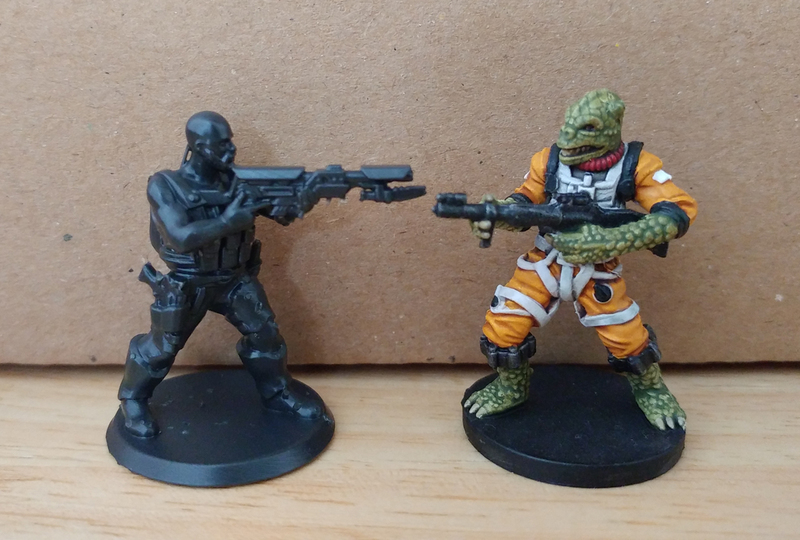 As well as the Star Wars RPG, I’ve also taken on the mantle of GM for another group of friends who want to try RPGs – for simplicity’s sake I picked up the Genesys Core rulebook, since it uses the same system as the Star Wars RPG I already play – and of course, the player characters need miniatures! 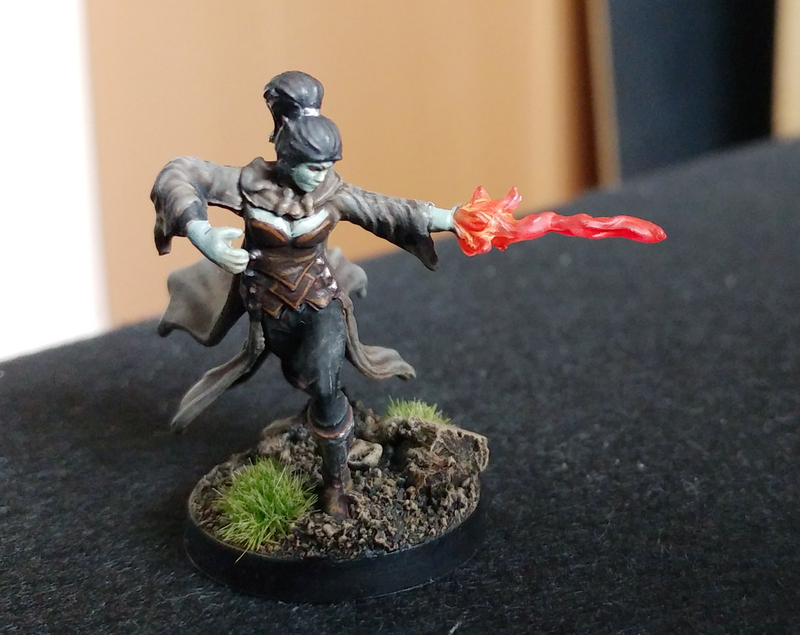 At the expo I picked up a few cheap pre-primed D&D figures on the cheap, and I’m looking forward to guiding them through their adventures in the Realm of Generia (heh heh!). I’ve not had a chance to get these in the light-tent yet, but I’ll put some better pics of them up as soon as I do! 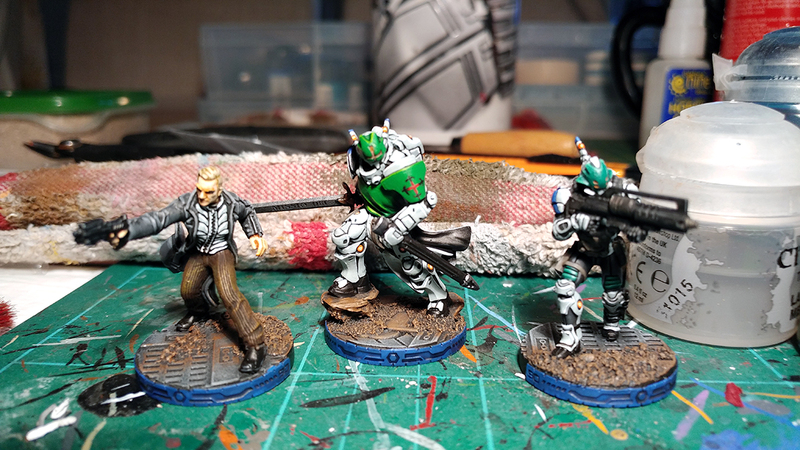 It’s been good fun painting these, and I’m hoping to get a full shot of all of them together further down the line, as I’ve painted quite a few in this scheme for my friend! 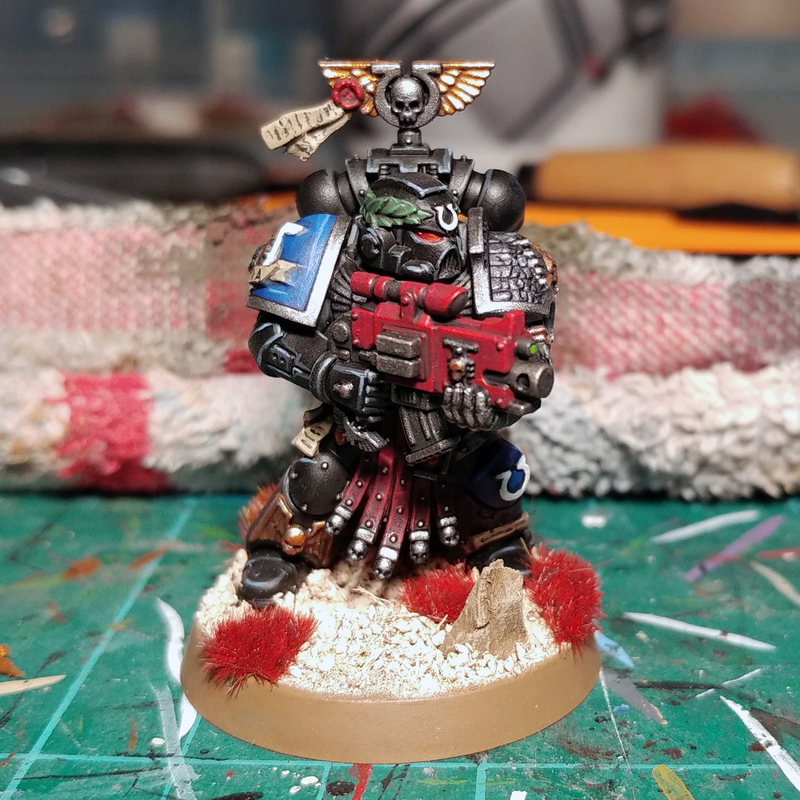 And now, to round off this particular post, here’s the first of several Deathwatch figures that I’ve finally decided to paint up, given that Games Workshop are about to release Kill Team – their proper attempt at a skirmish-level miniatures game. 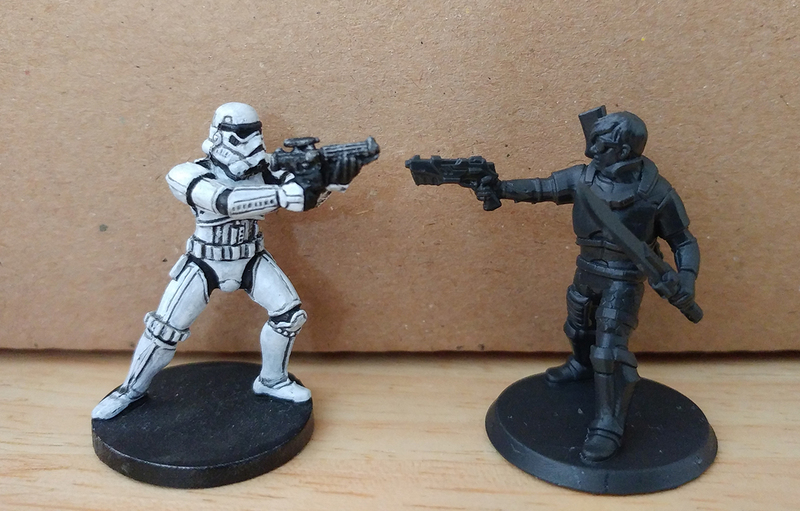 While it doesn’t have the depth of Infinity’s rules, it does seem to have had a fair bit of thought put into it, and I’m excited to try out a simpler rules-set that allows me to have skirmishes with just a few models per side. I’ve based him up to mimic the look of Nessus, one of one of the planets in Destiny 2 – a game which has sucked up a frankly unhealthy amount of my time of late! Right, that’s it for now – I’ll be back again soon with more hobby content! Nice update! 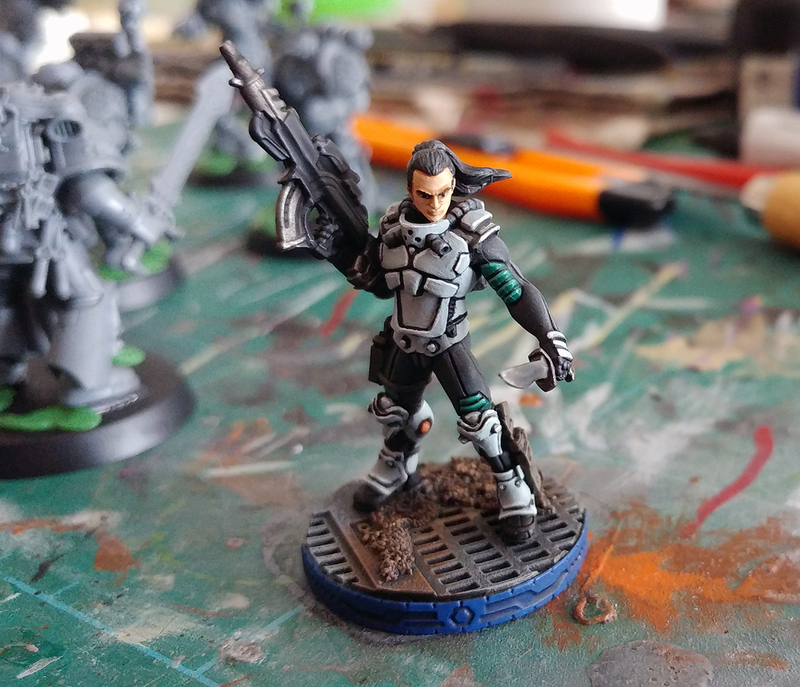 Your painting is amazing as always; it is so inspiring to see what could be possible on these detailed Infinity miniatures. 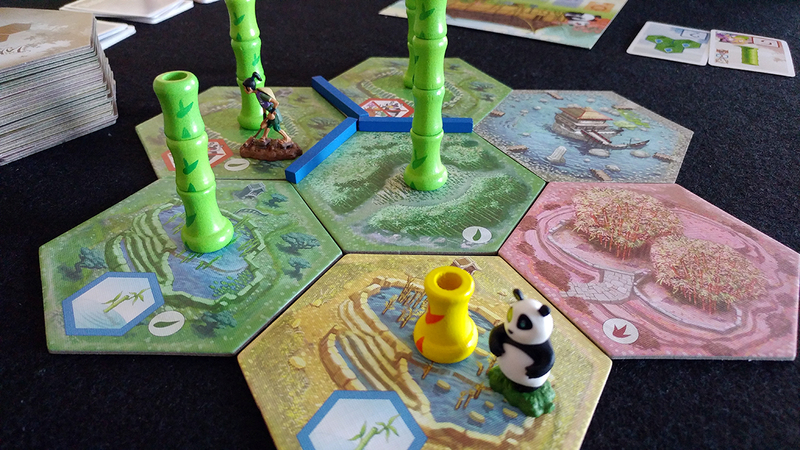 I play Takenoko with my children and it has been a big hit. Even if you lose you get to move a panda across the board.